Artillery soldiers conduct a practice shoot at 5th Canadian Division Support Base during Exercise TURBULENT WINDS on October 26, 2017. Canadian Army researchers are investigating cutting-edge materials with the potential to make munitions more powerful and reducing their potential for collateral damage. Photo: Mylene Frenette, Combat Training Centre, Gagetown. ©2017 DND/MDN Canada. 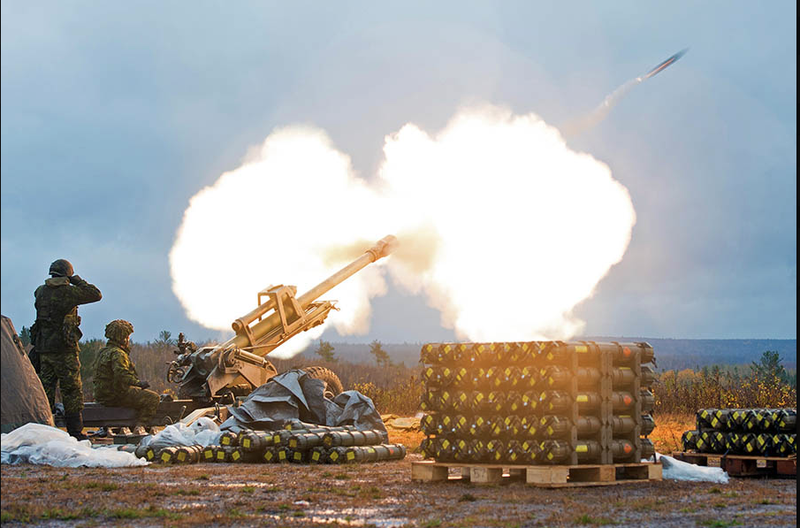 Medicine Hat, Alberta — New technology now being assessed by the Canadian Army (CA)’s research and development arm has the potential to increase the power of artillery munitions while also reducing the collateral damage they may cause. Results from an initial trial conducted in fall 2017 at Defence Research and Development Canada (DRDC)’s Suffield Research Centre in Alberta are promising, explained Jason Braden, DRDC’s Land Combat Systems Program Manager, though as much as five years of research still lies ahead. The rounds function similarly to thermobaric weapons, which use combustible liquids or aerosols, but with one key difference. Making the blast power adjustable is also one of DRDC’s objectives. The CA first began investigating this area in 2005 and Mr. Braden noted that Canada has emerged as a leader in research and development along with the United States and Germany. All three nations have been sharing information, he added. This year’s trial also saw separate elements of the Canadian Armed Forces collaborate. While the CA assessed the viability of SRM in an artillery context, Royal Canadian Air Force researchers tested it in the form of 500-pound (or about 227-kilogram) air-dropped bombs. Mr. Braden explained also that DRDC is also breaking new ground by bringing industry into the R&D process earlier than before. Major Travis Maxwell, with the CA’s Directorate of Land Resources, said the CA is keenly watching developments.